It’s time for another Christmas inspired recipe, initially you might look at this and think gala pie really doesn’t seem at all festive. While you’d be right for thinking that, the reason I associate gala pie with Christmas is because of the amazing tea time spread that my Mum always makes. Normally after a day filled with a huge roast dinner, Christmas pudding (with a criminal amount of brandy sauce) and perhaps a mince pie or two washed down with a lot of sherry or port, you’d probably think you wouldn’t want anything else to eat. However this is the day of excess and indulgence, we normally have a buffet that we graze on throughout the evening. There’s a cheeseboard, vegetables and dips and of course my Dad’s favourite… gala pie. Normally it’s shop bought, but this year I decided to have a go at making my own. I’ve no idea why it’s called gala pie, I looked online and I even consulted my copy of Larousse Gastronomique, but I couldn’t find an answer, so if anyone knows do tell me. 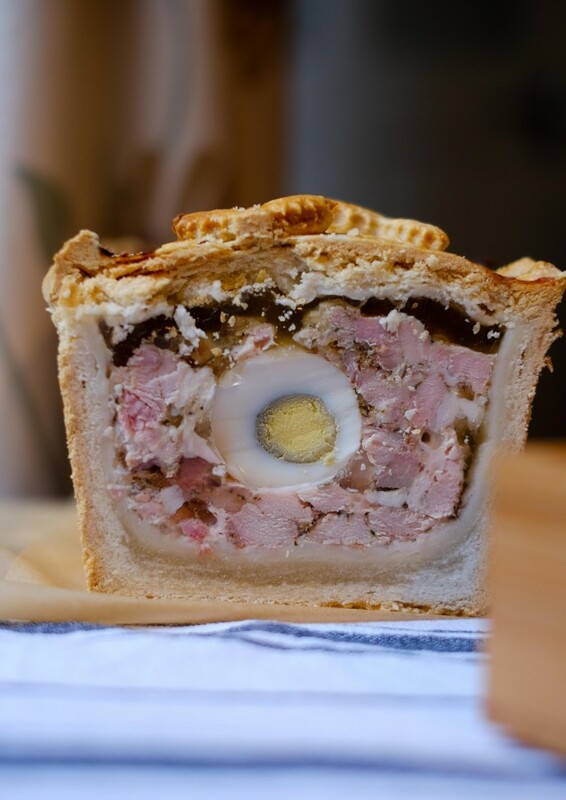 Some of you may not be familiar with gala pie at all, it’s basically a pork pie cooked in a loaf tin with a central column of boiled eggs running through the middle. Apparently when this is produced commercially, they create one long egg for the middle! They boil the yolks in a tube to get a cylinder and then they place the cooked yolks in a larger tube and put egg white around the yolks and boil again. This means they are left with a perfect tube of egg. Pure alchemy! I just cheated by trimming the excess white from the egg and layered them in the tin touching each other to limit the potential for a lack of yolk. No one likes to feel short changed by the egg in their slice of gala pie. You can decorate the top of your pie however you like, I went with holly to increase the festive theme. 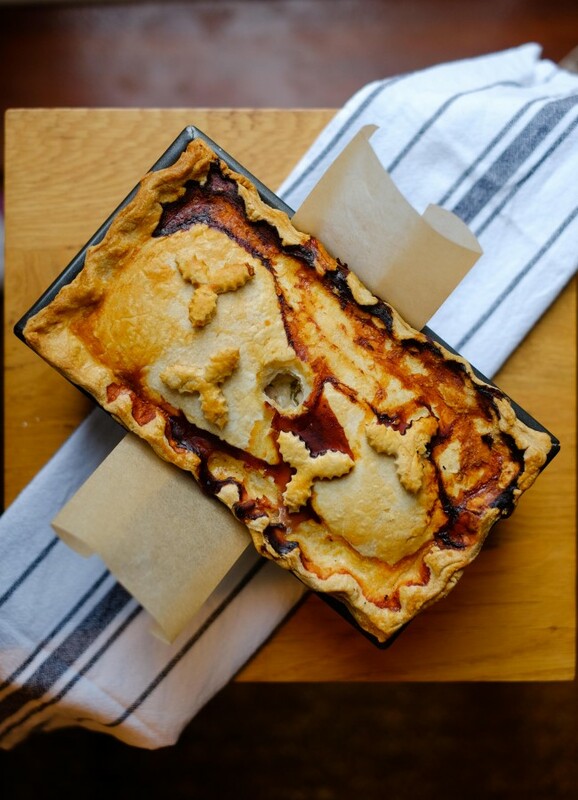 The pie is made with a hot water crust pastry, which is so easy to work with and a really forgiving pastry. 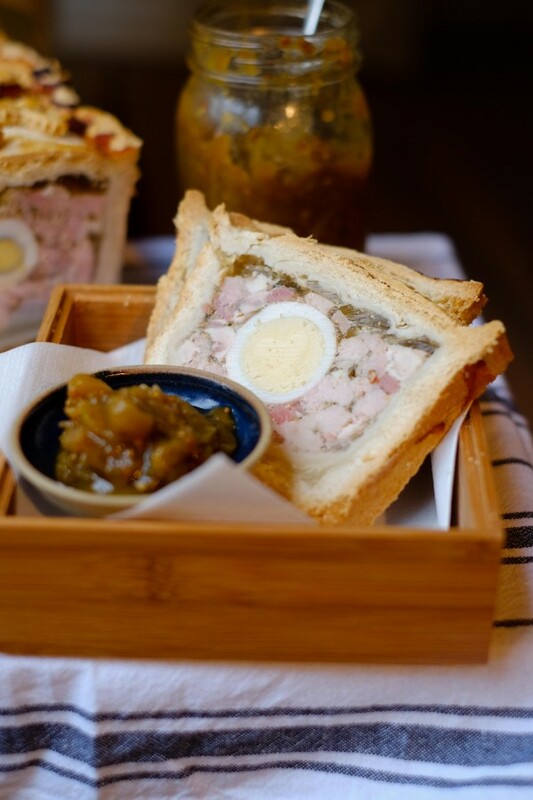 It’s the same recipe I used for my hand-raised pork pies. The pastry is strong when cooked, which means it can easily contain the meat and all of the jelly that is added to the pie after cooking. When I was young, I hated the jelly and I used to always leave it for someone else to eat, now it’s almost my favourite part. Isn’t it strange how our tastes change as we get older. This Gala Pie is perfect for a cold teatime spread, or a boxing day meal of leftovers. The finished pie can be frozen if you want to make it in advance. Once you cut the pie, it'll last a week in the fridge wrapped in clingfilm or stored in a airtight container. The day before you want to make the gala pie, put 50g of the gammon, chopped into small pieces, into a food processor with the sage, pepper, mace and ginger. Add the cold water and blitz this to a smooth paste, then put it into a bowl with the pork chops and remaining gammon, both cut into 1cm cubes and stir well. Chill the filling overnight. Rub the butter into the flour until the mixture resembles breadcrumbs. Place the lard and water in a saucepan and heat gently until the lard has melted and the mixture is hot but not boiling. Add the salt, stir until it dissolves, then pour this over the flour and mix quickly into a dough. Work it with a knife to begin with, then as soon as it is cool enough to get your hands in, knead the dough well with your fingers until it is mixed evenly and formed into a ball. Press the dough out onto a plate, cover with paper or clingfilm and leave until barely warm (about 24-26C). Lightly flour the work surface and roll the dough out to about ½cm thick. Fold the dough in thirds (like a letter), then repeat this roll and fold again. Take a standard 1lb loaf tin and place a band of baking parchment across the middle, this will double up as a handle when the pie is baked. Leave the pastry to cool to room temperature (21C) and then cut off two thirds of the pastry, put the smaller piece to one side and on a floured surface roll out the other piece of pastry, so that it is bigger than the loaf tin. Place the pastry in the tin and mould it up the sides of the tin and ensure there is enough to join to the lid on the edges. 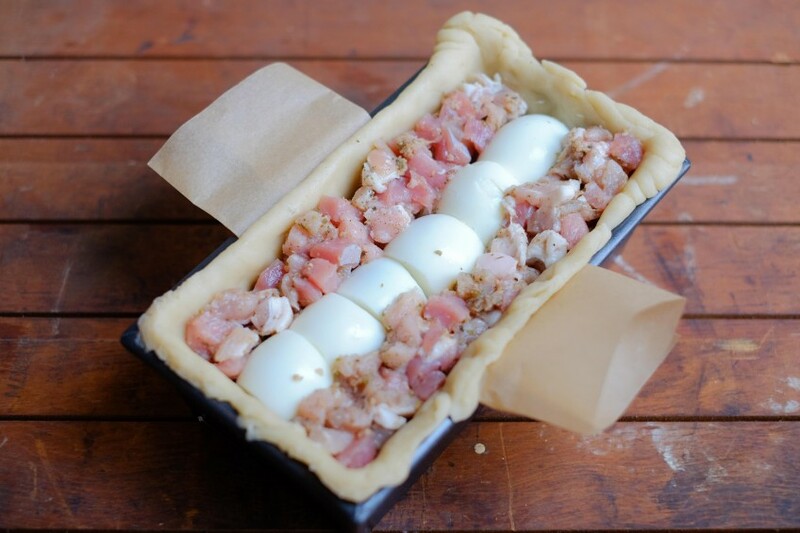 Pack just under half of the prepared meat into the bottom of the pie, add the eggs end to end in a line so that they touch the pastry at each end. Pack more meat either side of the eggs and a final layer on top to completely encase the eggs. Roll out the remaining piece of pastry (at this point reserve a little if you want to decorate the top), cut it to size if necessary and then brush the exposed bits of pastry in the tin with the egg so the lid can be stuck together. 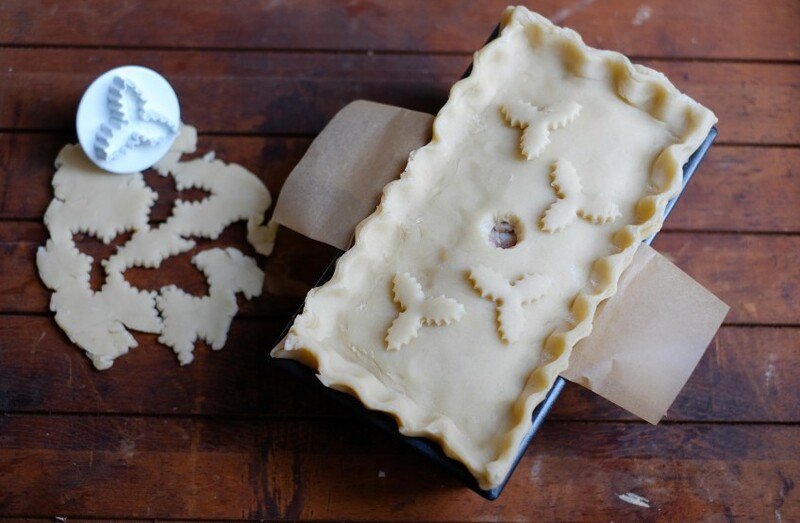 Crimp the edges of the pastry together and then cut a hole in the middle of the pie, decorate with holly leaves or any decorations of your choice. Place the pie in the fridge for 30 mins to firm up, then pre-heat the oven to 180C Fan, brush the pie with egg and bake for 2 hours. Let the pies cool for 30 minutes, then make the jelly by crumbling the stock cubes into the boiling water in a jug and stirring well. Sprinkle the powdered gelatine into the warm water, stirring until dissolved (or cut the leaf gelatine into small pieces and soak in the warm water until soft). Stir this in with the stock and cool slightly. Leave the pie in the tin and pour enough jelly into the pie through the hole in the top and leave to chill overnight before eating. You may find that you need to add the jelly in batches, as it will fill up and then you'll be able to fit more gelatine in the pie. 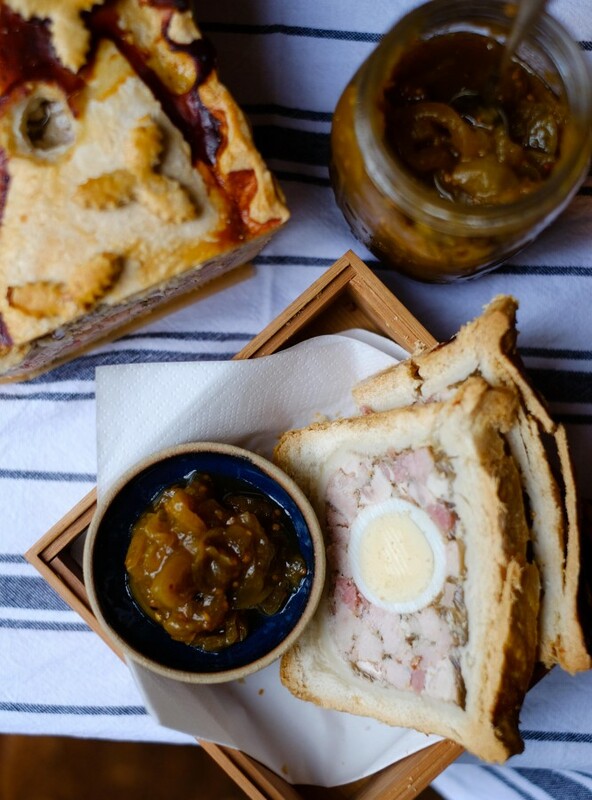 Leave the pie to cool overnight and then eat it the next day, it's delicious served with English mustard or green tomato chutney. 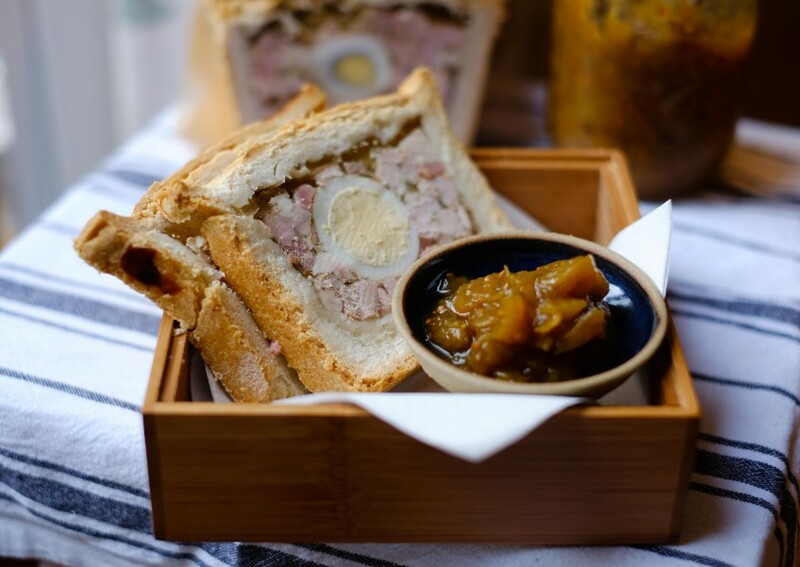 Gala pie is great with Colman’s English mustard or a nice chutney. 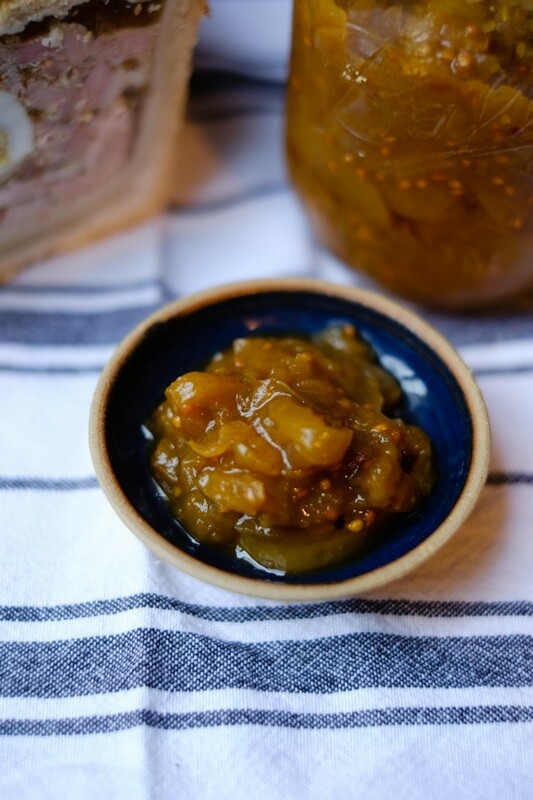 I served mine with a green tomato chutney, I made this chutney because I had so many green tomatoes this summer, that I really didn’t know what to do with them all. The recipe for the chutney can be found here, have a good read of the comments, as I tweaked the recipe. I left out the sultanas as I really dislike them in chutney and I reduced the vinegar a little too. Have a great Christmas everyone, however you celebrate it and whatever you eat and drink along the way! Hi, what size pie in dimentions is this pie & how many slices could i get from it. What a fabulous looking pie! I have only ever made vegetarian versions of hot water crust pastry so I’m not sure how it compares to the real deal with lard, probably a little less crisp I imagine. My family always do a big Boxing day buffet and this pie would be perfect for it! Thanks Hannah, what do you use instead of lard in the vegetarian version? 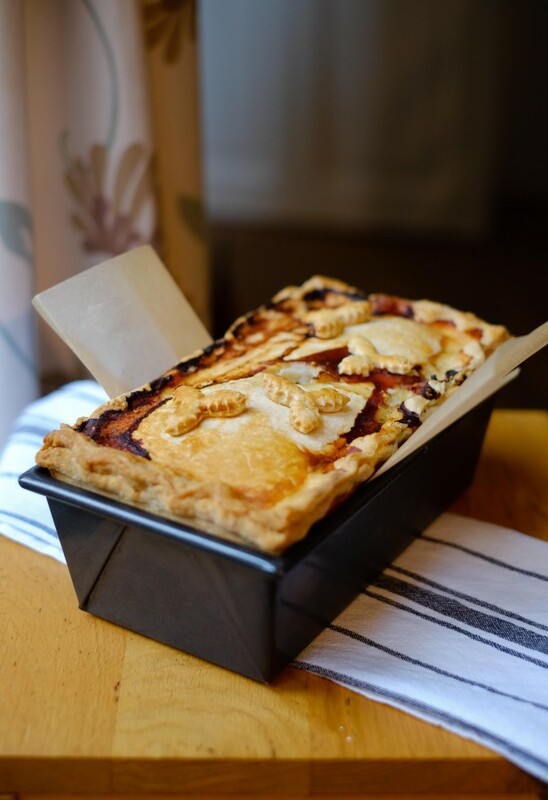 This is a really crisp pastry and it tastes great, this is a perfect Boxing Day pie. Have a great Christmas. I am with Lucy, a raised pie has been on my to-do list for ages. Yours is absolutely beautiful and looks very Christmassy to me! Pinning! Thanks Julia – you’re too kind, this is a great pie and would be perfect on Boxing Day, when you can’t face preparing any more food – it keeps really well. The long eggy tube sounds a bit grim when you put it like that!